Thousands of hospital workers in California plan to walk out this week, claiming that their employer Kaiser Permanente is jeopardizing patient care by understaffing the psychiatry department. Psychologists, therapists and social workers launched Monday what is planned to be a week-long protest. By Friday, 2,600 are expected to walk the picket line outside of 35 Kaiser Permanente-owned hospitals and offices in California. 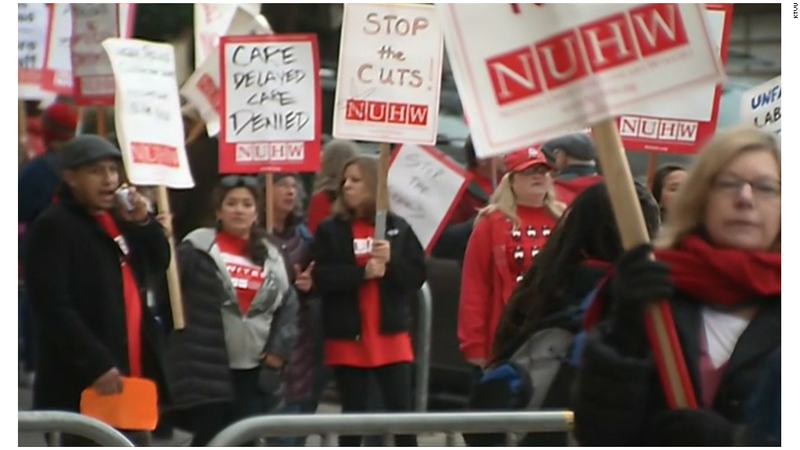 The action is organized by leaders of the National Union of Healthcare Workers, which has been battling Kaiser in contract negotiations on behalf of the mental healthcare professionals for four years. Patients have to wait weeks for an appointment, according to striking workers. They allege that Kaiser intentionally keeps the mental health department understaffed, despite the fact that the company raked in $3 billion in profit last year. "For patients suffering from depression and other mental conditions, these delays can be insurmountable obstacles," clinical social worker Clement Papazian told CNNMoney from a picket line in San Francisco where he said hundreds of workers had gathered. He is also the president of the union's Northern California chapter. 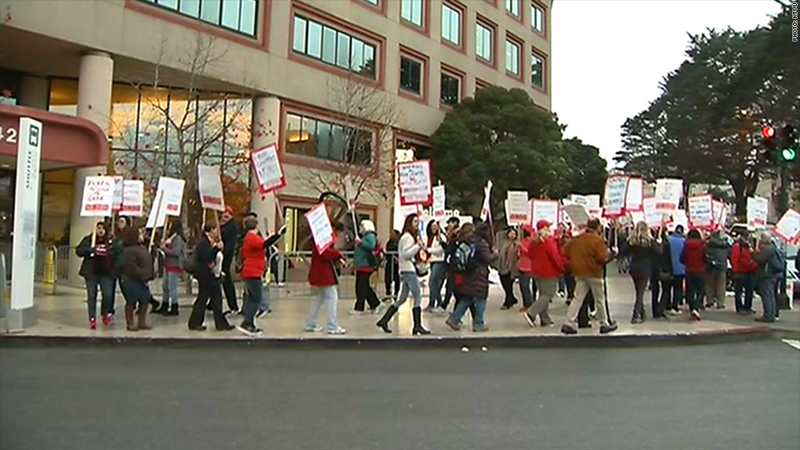 Kaiser Permanente workers launched a week-long strike in California Monday. But Kaiser Permanente said these claims are unfounded. Kaiser has hired more than 200 therapists since 2011, an increase of 25%, and will continue to hire more, said John Nelson, vice president of government relations. It's boosting staff to meet the growing need for mental health services, which has been partly driven by the recession, Nelson said. Plus, Kaiser's membership has grown 8% since 2011. Kaiser Permanente is one the nation's largest health systems. It has 9.5 million members, runs 38 hospitals and 618 medical offices, all primarily in California. It's not the first time Kaiser has has been criticized for keeping patients waiting. It paid a $4 million fine last year after state regulators found problems with its appointment tracking system that could cause excessive wait times for patients. Nelson said Kaiser has already addressed those issues and that the fine was "excessive and unwarranted." Whatever additional hiring Kaiser has done is not adequate, Papazian said. "We're not staffed to handle the case load," he said.